Learn when to replace your pool safety cover. 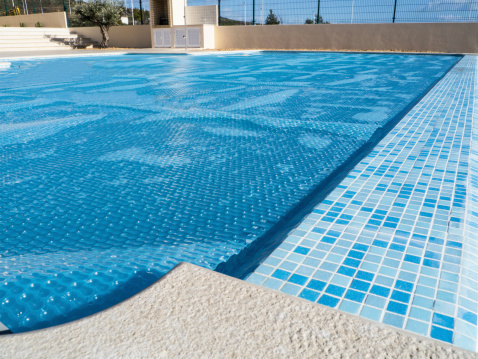 Pool safety covers are an essential part of ensuring that your pool is secure enough to prevent injury and danger to anyone who enters your property. But like with most things, pool covers have a lifespan. Knowing when to replace your pool cover is an essential safety step you do not want to skip. It’s entirely natural for a pool cover to degrade over the years. Not only is it subject to harsh UV lights, but weather, debris, and general wear can add up. This may lead to a cover that is not only unsafe to living things but to your pool as well. Some of the key signs are easily visible. If the sewn straps show that their stitching is coming loose, or they have signs of wear such as shredding or failing, this is a sure sign the cover needs to be replaced. Other items to look out for include deterioration, like worn spots, which can quickly become a serious hazard. Every year as you install your safety cover, you should give it a thorough examination to check for signs of brittleness and dry rot. Additionally, be sure to watch out for obvious holes of any size and signs of insect or rodent damage. If you see any of the above signs, you should work with a professional to see if your safety cover can be repaired or if it must be entirely replaced. Pool safety covers have a lifespan of 10-12 years if treated correctly. If you want to ensure you get the full lifespan of use out of yours, there are several steps you can take. In general, if you properly store and care for your cover, the chances of needing a replacement sooner is very low. Start by ensuring your pool cover stays clean and dry when it is both in and out of use. When not in use, ensure that it is correctly stored in a storage bag. Using a cover cleaner before putting the cover away such as Stow Away will prevent mildew from growing while the cover is stored. Make sure to remove all debris from the cover as well. Staying dry and put away properly ensures that you don’t suffer from mold and mildew and prevents animal and insect damage. When the cover is on your pool, try to keep anything or anyone from getting on it. While it is intended to keep people, animals, and things out of your pool- this is designed to be a safety feature rather than as a regular occurrence. Lastly, be sure to patch any small cosmetic holes as soon as they are found. This can help prevent them from becoming larger. Let us help you find the perfect pool cover! Our sales and service teams are here to help! At Regina Pools & Spas, located in Timonium, MD, customers have designed the way our business is run and have shaped our unique service philosophy: “Do it when they want, the way they want, and with what they want.” We hope to care for each person throughout the many years that they enjoy our products. We have an outstanding record with the Maryland Home Improvement Commission and have won diverse awards and recognitions for our pools and spas, including being the first Maryland pool company in the Aqua 100 Hall of Fame. Stop by our showroom or contact us by calling 410-252-5116 or emailing sales@reginapoolsandspas.com. Don’t forget to follow us on Facebook, Twitter, Pinterest, Instagram, Google+, and Houzz! This entry was posted on Friday, January 4th, 2019 at 4:10 pm. Both comments and pings are currently closed.